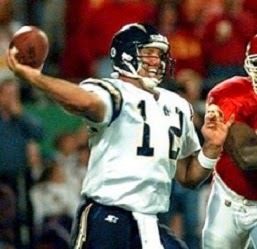 The Monday night matchup on October 9, 1995 featured two AFC West rivals, the Kansas City Chiefs, off to a 5-1 start, against the San Diego Chargers, who were 3-2 and the defending conference champions. The Chiefs had already experience plenty of drama, having played in two overtime games, both of which they won. Under Head Coach Marty Schottenheimer, Kansas City had reached the playoffs in each of the five preceding seasons, although without a Super Bowl appearance to show for it. QB Joe Montana retired and the Chiefs grabbed another ex-49er, 33-year-old Steve Bono, to take over the starting job, with good results thus far. Another veteran, RB Marcus Allen, led a running attack that also included FB Kimble Anders, an able blocker and receiver as well as rusher. The receivers were not spectacular, but a new backup wide receiver, Tamarick Vanover (pictured above), who had spent his first year in the CFL, was beginning to make an impression as a kick returner. The defense was solid from front to back. The Chargers, coached by Bobby Ross, were coming off a surprising, if ultimately humiliating, Super Bowl appearance following the ’94 season. Tough and steady QB Stan Humphries had WR Tony Martin as his most reliable target. RB Natrone Means led the ground game and LB Junior Seau was the cornerstone of the defense. There were 79,288 fans on hand for the Monday night game at Arrowhead Stadium. The Chargers took the opening kickoff and put together a long drive of over nine minutes that covered 63 yards in 19 plays. They converted four third downs along the way, all on passes by Stan Humphries, while Natrone Means ran the ball eight times. The series finally stalled at the Kansas City 10 after San Diego was backed up by a false start and John Carney kicked a 28-yard field goal. The Chiefs finished out the opening period with a long series of their own, taking 14 plays to advance 67 yards. On the last play of the first quarter, Steve Bono threw to Kimble Anders for a pickup of 28 yards to the San Diego eight in a third-and-nine situation. Four plays later, Lin Elliott kicked a 21-yard field goal to tie the score at 3-3. WR Andre Coleman returned the ensuing kickoff 54 yards to the KC 37. The Chargers, helped by a pass interference penalty, took four plays to reach the end zone as Means went in from two yards out. Carney added the extra point to put the visitors back in front by 10-3. Kansas City responded with another long 13-play, 63-yard possession. Bono connected with WR Webster Slaughter (pictured below) for a 38-yard gain to the San Diego 20 and, after chipping away for another ten yards, Elliott booted a field goal of 28 yards. The Chiefs got the ball right back when safety Martin Bayless forced Coleman to fumble and recovered at the San Diego 22. Bono immediately threw to WR Lake Dawson for 20 yards and, two plays later, he passed to Anders for a one-yard touchdown. Elliott added the PAT and Kansas City was ahead by 13-10. The Chargers had to punt on their next series – the first by either team coming with less than two minutes remaining in the first half. The Chiefs moved quickly down the field as Bono hit Slaughter for another long gain, this time covering 36 yards to the San Diego 44. But after advancing to the 18, Bono fumbled when sacked by DE Raylee Johnson and DT Shawn Lee recovered for the Chargers. There were 43 seconds left on the clock as San Diego took over possession and Humphries passed on every down to get into Kansas City territory. An unsportsmanlike conduct penalty on CB James Hasty that came on top of a nine-yard completion to Tony Martin got the ball down to the KC 18 and Carney kicked a 36-yard field goal to tie the score at 13-13 going into halftime. The eventful first half was followed by a scoreless third quarter. Kansas City, in a series that stretched into the final period, finally put together an 11-play drive that covered 54 yards and broke the deadlock. 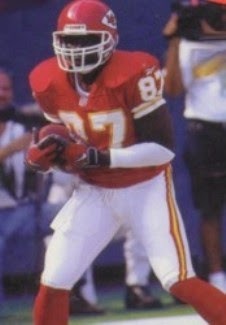 Bono completed his first three passes, the longest covering 23 yards to Dawson, and with Marcus Allen running the ball three times for 15 yards and Tamarick Vanover adding five yards on an end-around, the Chiefs reached the San Diego 31 and Elliott kicked his third field goal, covering 49 yards. Kansas City was back in the lead by 16-13. The Chargers responded with a ten-play, 73-yard drive. Humphries (pictured below) completed five passes, with one to WR Shawn Jefferson that covered 45 yards and the last to TE Shannon Mitchell for a four-yard TD. Carney’s conversion put the visitors in front once more by 20-16. The Chiefs punted following a short series and the Chargers drove to another score. On a third-and-11 play, Humphries threw to RB Ronnie Harmon for 44 yards to the KC 28 and, four plays later facing second-and-14, he connected with TE Duane Young for 12 yards to the nine yard line at the two-minute warning. San Diego was unable to convert the third down and Carney kicked a 29-yard field goal that made it a seven-point contest. Following the kickoff, the Chiefs took over at their 21 with the time now down to 1:06. Bono passed to Dawson for 27 yards and, after his next throw fell incomplete, hit on his next three aerials. The third was to Slaughter for 16 yards to the San Diego 23. Two plays later, Bono passed to TE Derrick Walker for an 18-yard touchdown. Elliott added the all-important extra point and the game headed toward overtime tied at 23-23. With Humphries having an injured shoulder, Gale Gilbert was at quarterback for the Chargers as they took first possession in the extra period, and while they ultimately reached Kansas City territory, they were forced to punt. The Chiefs went three-and-out and punted as well. With the ball at the San Diego 43, Gilbert missed on two passes and then was sacked by DE Neil Smith. That set the stage for another punt, and Darren Bennett’s 47-yard kick was taken by Vanover at his 14. He proceeded to return it 86 yards, breaking a tackle before streaking down the sideline for a game-winning touchdown. Kansas City came away with an electrifying 29-23 win, their third in overtime of the season. The statistics were as close as the score, with the Chiefs holding the edge in total yards (379 to 369) and San Diego generating the most first downs (25 to 21). Neither team was able to run effectively, with Kansas City gaining 62 yards on 25 running plays and the Chargers compiling only 51 on 31 carries. Net passing yards were nearly equal, with San Diego holding a 318 to 317 edge. The Chiefs recorded three sacks, two by Neil Smith, to one by the Chargers, and San Diego turned the ball over three times, to one suffered by KC. Steve Bono (pictured at left) completed 27 of 41 passes for 329 yards and two touchdowns while having none intercepted. Derrick Walker had 6 catches for 45 yards that included the tying TD and Webster Slaughter gained 90 yards on his three receptions while Lake Dawson was right behind with 86 yards on four catches. 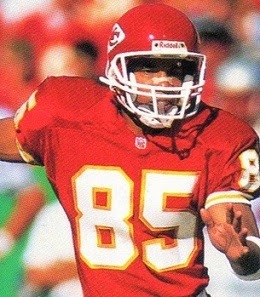 Marcus Allen topped the Kansas City running attack by gaining a mere 26 yards on 14 attempts. For the Chargers, Stan Humphries was successful on 24 of 34 throws for 315 yards and a TD while also giving up no interceptions. Tony Martin led the receivers with 7 catches for 88 yards. Natrone Means was held to 33 yards on 24 carries that included a score, but also caught 5 passes for another 33 yards. After appearing in three overtime contests among their first six games, the Chiefs appeared in no others the rest of the way. They finished with a league-best 13-3 record but lost a 10-7 verdict to the Colts in the Divisional playoff round as Bono tossed three interceptions and Lin Elliott missed three field goal attempts. San Diego lost for a third consecutive time after being beaten by the Chiefs and, during that midseason stretch, won only one of seven contests. However, the Chargers rallied to win five straight and close out the regular season at 9-7, good for second place in the AFC West and a Wild Card playoff spot. They also lost to the Colts, in the Wild Card game. Tamarick Vanover went on to lead the NFL in punt return yardage with 540, averaging 10.6 yards per return along with a 25.5 average on kickoff returns. In addition to the one long punt return touchdown, he scored two more on kickoffs.